Posted: September 23rd, 2008 under Hamradio, Propagation. LA7SL sent me a mail with some good news yesterday. Finally new sunspots appearing. This is certainly great news for all radioamateurs. The higher bands has been quite dead way too long. Read the news below. NEW SUNSPOT: For the first time in months, a significant sunspot is emerging on the sun. It is a fast-growing active region with two dark cores, each larger than Earth. The magnetic polarity of the sunspot identifies it as a member of new Sunspot Cycle 24. 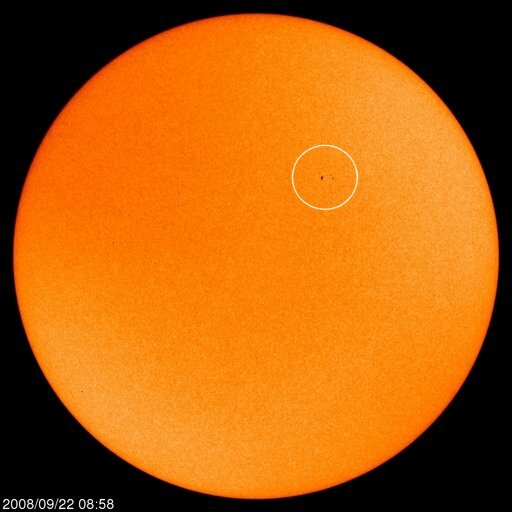 Because the year 2008 has brought so many blank suns, some observers have wondered if we are ever going to climb out of the ongoing deep solar minimum. Today’s new sunspot is an encouraging sign that the 11-year solar cycle is indeed progressing, albeit slowly. Visit http://spaceweather.com for sunspot photos and updates. SEPTEMBER EQUINOX: Seasons on Earth change much faster than they do on the sun. Today, autumn begins in the northern hemisphere and spring in the southern hemisphere when the sun crosses the celestial equator. The crossing, called the "equinox," takes place at 1544 UT (11:44 EDT) on Monday, Sept. 22nd. Happy equinox!